"Prophecy tells us that at the very end the number of men with ambitious minds will decrease, while the people of good hearts, those who live in harmony with the earth, will increase until the earth is at last rid of evil. If the Hopi are right, this will be accomplished, and the earth will bloom again. The spiritual door remains open. Why not join the righteous people who are moving toward it?" From Techqua Ikachi (Hopi for "Land and Life"), a newsletter published by Hopi Elders. 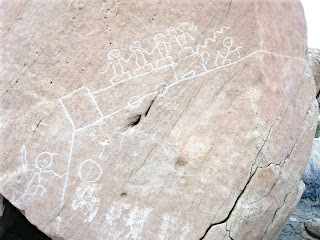 The photographs above provide several different views of Prophecy Rock, known to the Hopi as the Life Plan. 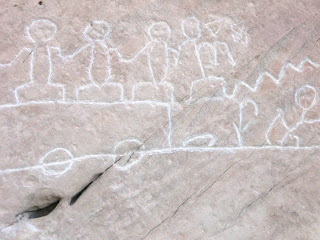 I thank my friend, Hopi Elder, Martin Gashweseoma, for taking me to Prophecy Rock in June 2007 and for giving me permission to photograph it. For centuries, the Hopi have lived in Hopiland, located on three mesas which rise above the desert floor of northern Arizona. With a simplicity characteristic of the Hopi, these mesas are called First Mesa, Second Mesa and Third Mesa. Farming is done on the desert floor surrounding these mesas. The major crops grown are corn, beans and squash. My journey into Hopiland had begun. The word Hopi means "peace." It is said among American Indians that the Hopi are "The Keepers of the Peace." The Hopi have held the energy for World Peace within the sacred circle of their tribe for generations. These peaceful people tell us that it is through the seriousness with which the Traditional Hopi practice their annual ceremonies and follow the Universal Plan given to them by the Creator that the Earth is held in balance. Without this, they say, the Earth would spin out of control. The Traditional Hopi have grown up in a culture that places a high value on the mystical and the spiritual. They are a modest, simple people, and they also are very hospitable. To understand the Traditional Hopi takes not only an understanding of American Indian spirituality but also the ability to connect to the unique spiritual nature and tradition of the Hopi. More importantly, it takes an open heart. The original village of Oraibi is located on Third Mesa and is the oldest continuously lived-in settlement in North America. Archaeologists date it back to 1100 CE. When the clans of the Hopi ancestors migrated to Oraibi those many centuries ago, they were seeking a destination which, as told to them by the Creator, was "Earth Center." It would be a place where all of the Hopi clans would settle to take care of the land and practice their ceremonies. The place where they settled is now known as Old Oraibi. It's original name was Sip-Oraibi, which, according to my friend, the Hopi Elder, Martin Gashweseoma, means "rock solid; anchored down into the Earth." 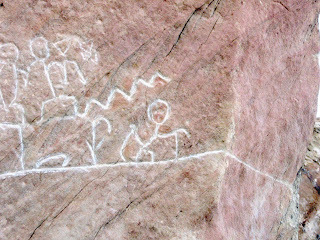 Prophecy Rock, which is known to the Hopi as the "Life Plan," is located near the village of Old Oraibi. Martin Gashweseoma was born on December 7, 1922. He is one of the last Hopi Elders. When I first arrived in Hopiland, I had no idea where Martin lived or how I would find him. I only knew I needed to meet him. I had traveled to Hopiland on blind faith, following the guidance of my inner voice. Two days after I arrived, I was led to Martin. Meeting him would change me forever. On the day he and I met, while we were still getting acquainted, Martin took me to see the Hopi Life Plan and gave me permission to take photos—lots of photos. Five of them can be seen above. I was very surprised by this because the Hopi do not allow photos of their sacred sites, especially the Life Plan. They are very clear about this. But Martin not only allowed me to take the photos, he encouraged me. He even went so far as to look around for a kind of stone that had a texture similar to chalk and could be used to make chalk-like marks on the rock. When he found the kind of chalky stone he was looking for, he and I took turns using it to fill in with chalk every line and curve of the ancient inscriptions that had been carved into the rock centuries ago. I was reluctant to do this to something so old and so sacred to the Hopi, but Martin insisted, and by whitening the inscriptions with the chalk in this way we were able to bring out the full detail of every symbol, making the Life Plan stand out as sharply as possible for my camera. That which was ancient looked new again—a symbolic moment. I was not sure if anything like this had ever been done to the Life Plan before. As Martin and I took turns highlighting the inscriptions in this way, I felt that I, a white man, and Martin, an American Indian, were joining forces. Martin wanted to do all he could to ensure my photos would come out sharp and clear. He put a lot of effort into this because it was very important to him. I understood what was going on between us. Without saying it to me directly, Martin was telling me he knew why I had come. He knew I was there to start the work I would need to do to help communicate the Hopi message to the rest of the world. I knew what I was taking on. I had known for a long time. Martin knew too. We didn't discuss it. We just knew. Our friendship began there. The Hopi say that there have been four "Worlds." Three previous Worlds were destroyed, and we now are living in the Fourth World. The inscriptions of the Life Plan depict the two paths that people would take from the start of the Hopi Fourth World until the Fourth World ends and we transition into the Fifth World. Martin believes we now are in the midst of this transition. So do I. These inscriptions suggest to me there will be two different ways of living, co-existing side by side, and these two ways will be mutually exclusive. The path we take and the kind of world we live in depends on how we choose to live and what we choose to value the most--materialism and money, or balance with the Earth and a caring for one another. The top photo, above, shows all of the Life Plan. The other photos below it provide close up views of the different symbols in the Life Plan, starting with the symbols in the lower left and moving toward the upper right. You will notice in the top photo there are two horizontal lines. These represent the two paths of the Fourth World. The top line represents the path of money, materialism and technology--the modern world—and leads to eventual destruction. The Hopi have a name for this destruction. They call it Purification. Martin speaks often about Purification. He says Purification is just ahead. He and I have discussed this. I foresee much of what he foresees, I understand what he says, and I plan to write about it in a future article I'll post here. The bottom line represents the natural path—staying in balance with the earth, caring for one another and following the laws of the Creator. This path leads to happiness and everlasting life, as signified by the symbol of corn, the old person with the cane and the line extending all the way around the right side of the rock. There also are three circles drawn on the bottom line. 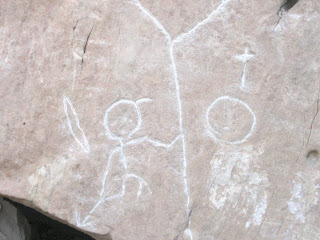 The first two of these circles, according to some Hopi, represent World War I and World War II. The third circle represents Purification—World War III. Martin says there will be "Purification and then the New Land and everlasting life for the survivors." "That's where we're headed," he says. The "survivors" are those who have chosen the natural path and who ultimately create a world in balance with the Earth. This will be the Fifth World, the new world which I know is coming. It will bring another side to life which most people cannot even comprehend right now. We will create the new world by mutually and of our own free wills raising our spiritual consciousness to become enlightened beings. This will bring us to everlasting life. Martin also told me that the first three of the four figures on the top line represent the enemies of the Traditional Hopi, including the government that Martin says "controls us" and those Hopi leaders (and, I presume, Hopi people) who have adopted the material ways of the white man. The vertical line under the third of these three figures connects the top line to the bottom line, and it represents the last chance for all who have strayed away and are on the path of materialism to get back on the natural path. (I interpret this also to mean it represents the last chance for all of us in the modern world to get back on the natural path.) According to other Hopis I spoke with, the fourth figure was added later. 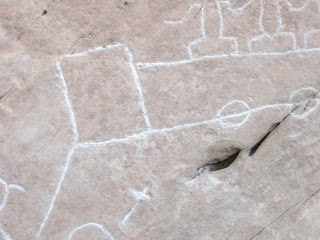 Martin explained to me the fourth figure represents "the one-hearted man" who will come and try to convince the government and the Hopi leaders (and I presume many others in the world) who have strayed to get back on the natural path. The jagged line to the right of the one-hearted man, Martin says, represents the energy that "is his protection." Martin also says the inscription foretells that the one-hearted man will fail. Other Hopis I spoke with informed me that originally the first three figures were headless, indicating these figures would be enemies of the Traditional Hopi, and that the fate of these enemies would be death. The heads were added later to satisfy the "expectations of outsiders." It is the second path, the natural path, which will lead us to evolve into what I have been calling "The New Humanity on the New Earth." I have dedicated this Blog to that goal. With all the trouble and turmoil in the world now, it seems to me we have lost our way. I like to think we are on the threshold of forming another counter-culture reminiscent of the 60s. Maybe we are. A worldwide shift in thought and attitude would help. I sense something is emerging. It just needs a little more coaxing to bring it to the surface. Perhaps some of us are ready--maybe we've been ready for a long time--to get back on the natural path. I know the Hopi can help us with this. The natural path is the path of spiritual understanding, and the spiritual understanding of the Hopi is ancient and sacred. It is woven into the fabric of Hopi culture. Their spiritual understanding is a gift the Hopi can give us, and along with this understanding, the Hopi can give us the spiritual nourishment and direction we so need to help us find our way again. These are gifts which could benefit us greatly, but only if we choose to receive them in a way that shows respect for their sacredness. Sacred gifts are not meant to be taken without asking. If we wish for the Hopi to share their gifts with us, we must learn how to approach the Hopi in a good way, in a spiritual way, in the American Indian way. The Hopi know how to keep the world in balance, and they do so through physical work and by working with energy. They have been doing it this way for generations. It is said that as soon as you cross into Hopiland, you walk into another dimension. I am here to confirm that this is true. A few days after I met Martin, I offered to work with him to help him clear his field for planting. I had been working with Martin in his field for an hour or so when the wind suddenly picked up and started blowing hard in my face. (I later learned the wind speed had at that time jumped up to 50 or 60 miles per hour. The winds continued like that for the rest of the day.) I reacted by turning and facing away from the wind. Then for just a second or two, I looked back. Again the wind was blowing in my face. I glanced at Martin. He was still working the ground with his hoe. As I glanced at him a feeling of peace and openness came over me. Once again I turned my back to the wind, and as I looked out beyond Martin's field, "out yonder," as Martin would say, across the floor of the northern Arizona desert, I felt myself unexpectedly pulled into a field of energy which I can only describe as the energy of creation. The energy took me in. I was immersed in it, like being inside of a living cell. All at once I felt merged with the source of everything, yet at the same time I felt my own individuality and with it my own power to initiate and create changes in the world around me, to manifest a thought into a reality, to create whatever I focused my atttention on, even to help create a new world. In that first moment when I felt myself pulled into the field of energy, I felt that the energy of creation and I had merged together, making the energy and me as one; then an instant later I felt my own individuality standing outside of the field of energy as I looked directly at it. Then, in yet another instant, I felt myself pulled once again into the field of energy and felt once more that the energy and I had become one. For a brief period of time, I don't how long, this experience continued, alternating, pulsing back and forth, as I felt myself merging with the heartbeat of creation, moving into the field of energy, then slipping out of it and then back into it again. The field of energy and I were separate, and yet the field of energy and I were also one. This paradox made sense to me. I understoood it. It was for me an intensely spiritual experience. I had been embraced by the very force of creation itself, the same force that I know transforms pure energy into material things. This force exists all over the universe. Some people call it God. The Traditional Hopi people call it "Creator." In that moment, I became a changed man. I had been opened to receive the light of spirit. Physicists tell us that everything is energy. The Hopi have known this truth for millennia (and I will have more to say about that in a moment). My experience in Martin's field is proof enough for me that the energy of creation is real. Furthermore, I saw and felt that our human spirits derive their own life energy from this source. We truly are all part of a greater whole. There is more than meets the eye. I believe we human beings are meant to be caretakers of this Earth, and I believe we would not have been given this responsibility without also being given the mental and spiritual power to fashion and nurture a peaceful, beautiful planet. We have this power, but we seem to have lost the knack for using it. I have only recently begun to discover, in part because of this visit and a second visit to Hopiland, how to work and shape and mold reality with this energy. My contact with the Hopi has awakened something in me. I won't go into all the details here, but I have come to understand how this energy gives us the ability to transform things, to turn a thought into a reality, to project outward from our being a positive mood and a feeling and an atmosphere to others all around us and, yes, even to create a future world of "happiness and everlasting life" as predicted in the Hopi Life Plan. Once we have learned how to work with this energy, our new world, I think, will become a blend of the physical and the spiritual, and I believe we will find ourselves one day able to shift back and forth between the two, between the physical and the spiritual, just as I did for a brief moment in Martin's field. We look outside and we see the world is in trouble. Big trouble. Our world is in a tug of war between that which is ending and that which is coming. It's a very exhilarating time to be alive on the Earth, and dangerous too. The challenges are great. The solution is simple. To be sure, a new world is coming, lighter, brighter and filled with joy, but we need to get ourselves ready for it. Before anything else, I think our preparation will require a shift in the way we live day to day and in the way we perceive ourselves and our world--a shift of thought and attitude back to feeling and caring and connecting again in the simple way that we all know is human. That simplicity creates good energy, and we need to have that good energy to work with. From there we can take the next step to advance in wisdom and tap into the magic of how to forge a new world for ourselves. Martin, in his own brand of English, said, "The people are wrongdoing. They won't listen. They are wrongdoing," and then he said there are two rules by which we should live our lives. First, express gratitude and "sing praises to the Creator" each day for all we have. Second, be caring of all other people, not just ourselves and our immediate families, but everyone. I know many of us already do this. We don't need to be told to be thankful and to be caring of everyone. But many others have lost sight of this, and that has created a dangerous imbalance for all of us. "The Hopi elders look with awe as the predictions of Maasaw [The Guardian Spirit of the Earth] and our prophets continue to unfold before their eyes. The fast life, the changes in attitudes and behavior of the world's people, contesting for power, boastfulness in know-how, increased immorality and materialism. The world's people do not realize these actions gradually diminish the life resources by opposing the laws of nature with our own designs. Clever as Man is, he did not see that his actions set nature in motion toward disastrous consequences." "According to our ancient prophecies, one day as we walk along our path we will arrive at a point of confusion because of the fast life resulting from the change from good to bad in our moral principles. Just as in our previous worlds, the lives of people and the leaders will become corrupted by greed and power. Honesty and truthfulness will wane." According to the Hopi, the path of nature, the natural path, is the path the Hopi were given instructions to follow by the Creator. It is the path whereby human beings work and maintain the Earth so that human beings can continue to live on it. The Hopi have their prayers, their ceremonies and their dances. But all of the rest of it is work to maintain the land. One Hopi man I spoke with gave me this comparison. He said that just as scientists in the western world work with the Periodic Table of the Elements and with concepts such as atomic weights and atomic numbers, the Hopi work with energy. They grow up learning how to work with the forces of nature. Western scientists tell us there are just over one hundred elements in the Periodic Table. The Hopi tell us there are about four hundred forces in nature. These forces are separate, distinct and conscious fields of energy, and the Hopi have a name for them. The Hopi call them Kachinas. Each Kachina is a spirit with power over a different aspect of the Earth, from thunder to lightening to wind to specific plants and animals. The Kachinas are spirits with which the Hopi have worked for millennia, and the Hopi are as adept at working with these spirits, these forces of nature, as westerners are at working with combining atoms and molecules into the metal alloys, plastics, fuels, pharmaceuticals and other products we produce to meet our needs. The Hopi are reluctant to talk about how they work with the forces of nature. For them it is a sacred way of life, passed down by word of mouth from generation to generation, which they have kept secret. But I sense some Hopi now may believe the time has come for them to go so far as to reveal their secrets to those who are ready. Their prophecies have told them the time for this would arrive. Perhaps the time is now. I believe it is through an understanding of these secrets that the Hopi, as well as those of us in the modern world who want to follow the natural path, will help create the new world that is coming, the Fifth World of the Hopi, The New Humanity on the New Earth. The Hopi are a humble, modest people, and keeping the world in balance is a task which requires their humility, or it will not succeed; and if the Hopi fail, the Earth may not survive. It is important that the Hopi culture is not only preserved, but also revitalized. There is much we in mainstream America and in other technologically advanced countries can learn from these simple, humble people of peace. Our survival as a species may depend on it. Copyright © 2008 by William L. Tenuto. All rights reserved. Thanks Bill for your focus, persistence and desire to connect people to the New Earth. My experience in the Canary Islands with activating the 7th Temple of Venus was one of seeing the New Earth generosity and simplicity as totally heart opening and one of immense transformation. Your message has been heard down Under in Australia.It has reminded me to remain open during these chaotic times of choice in ones path. I recently experienced the Yasi Cyclone in Townsville and felt Mother earths full Force in action. My heart is open and Ive been reminded to continue following the natural path in balance with nature again. Thankyou to the Hopi Indians and I Thank with gratitude Yasi for allowing me to see the right path again.